Look familiar? What do you get when you combine my 2 recent posts? Vegan Oatmeal Creme Pies! I used to take Little Debbie’s Oatmeal Creme Pies in my lunch probably almost every day in grade school. How about you? These were even better than Lil’ Deb and not as whoreish with SO many ingredients. The creme is only 1 ingredient coconut butter and the cookies are comprised of a recognizable 10 ingredients. Depending on when you made the coconut butter and if you’ve stored it in the fridge or counter – it may need to be softened again. To soften the coconut butter, fill a bowl with boiled water and place the entire jar of coconut butter in the bowl (make sure the water isn’t too high). Allow it to sit, stirring every couple minutes until it has softened. 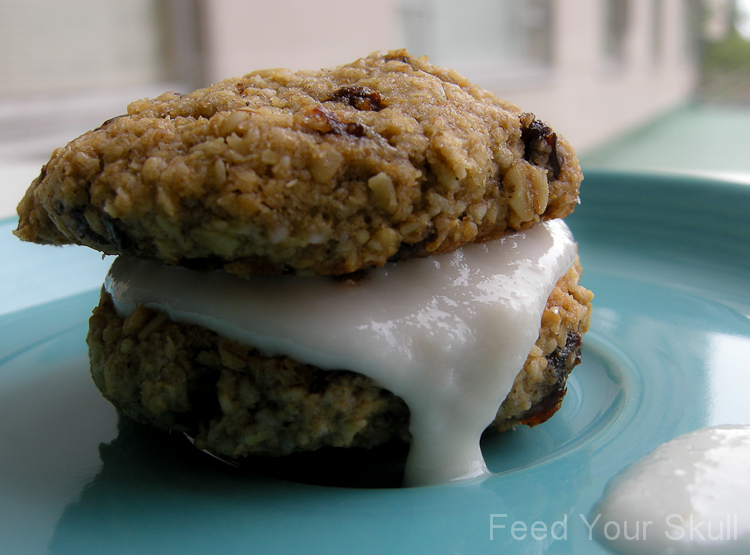 If you used a raw oatmeal cookie, these could even be raw vegan oatmeal creme pies.